From football shirt sponsorship to CSR campaigns, we are specialists. We can identify - and create - opportunities for you, negotiate the package, manage the project and measure the benefits. We’ve handled player appearances, match-day sponsorship of boxes and all related guest travel and catering requirements. 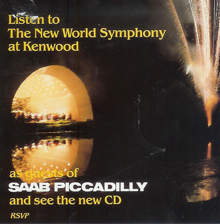 Did you know that we also organised the first ever sponsorship of Kenwood’s classical concert programme? Want to talk sponsorship? Email us or give us a call on 020 8201 8989.